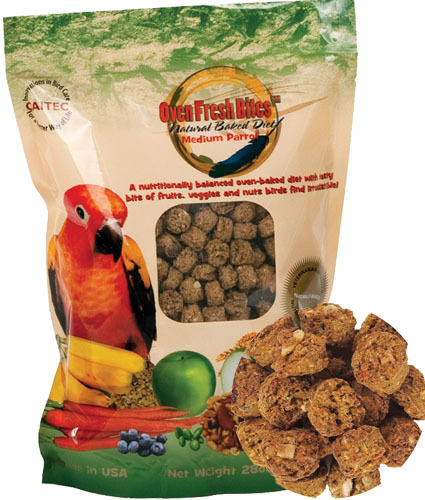 Oven Fresh Bites-Medium is formulated for Caiques, Senegal’s, African Grey parrots and similar birds. Oven Fresh Medium Bites supports the nutritional requirements of these birds and offers many of their preferred foods. Oven Fresh Bites has the unmistakable aroma of freshly baked goodies and the semi crispy texture that birds love. The human grade ingredients are slowly baked to perfection, these nuggets/pellets favorably compare to what you might bake at home in your own kitchen. The fresh, wholesome ingredients used to produce Oven Fresh Bites supply the foundation for good health, aid in the digestive process, provide necessary energy and improve skin and feather condition. No chemical preservatives used in the baking process. Check the ingredients in each Oven Fresh formula, it clearly illustrates that no health promoting products have been omitted. Care has been taken to supply appropriate levels of the essential vitamins, minerals, amino acids and a healthy balance Omega 3 and Omega 6 fatty acids.